You are here: Home / NREMT Exam / What Are the NREMT Skill Sheets? Many EMS students tend to put their focus on the written or “cognitive” National Registry (NREMT) exam, with little worry about the practical or “psychomotor” exam. For some, the written test feels more challenging, either because they consider themselves poor test takers in general or because the computer adaptive test (CAT) model doesn’t allow them to skip questions and do them at the end, and it will increase the total number of questions whenever they give an incorrect answer. Here’s some advice about why and how you should be putting the two parts of the NREMT exam together and why these skill sheets are a vital part of the EMT test prep process. Actually, compartmentalizing the two exams, as described above, is a poor strategy for test takers. What you want to do is integrate the material from the psychomotor exam with the cognitive exam. When you can visualize how you would go about dealing with a pulseless, non-breathing patient on the practical test, for example, it makes it easier to answer written questions that ask you to put resuscitation steps in order or that ask you to eliminate choices that would be inappropriate in that situation. 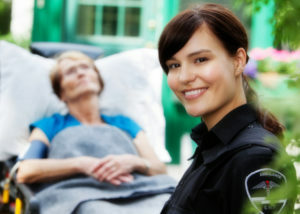 And of course, once you’re done with the written part of your certification, the bulk of your work as an EMT will be practical in nature, so you want to be able to know patient care algorithms in your sleep. In between these various steps, the examiner might give extra information, like informing you that the wound is continuing to bleed so you can adjust your treatment accordingly. The start and finish time at each station is recorded, and any critical information is also noted, such as if you mistakenly performed an inappropriate intervention. Remember, once you have your Skill Sheets, you want to use them in conjunction with your written exam study to maximize your potential on both exams. For example, you may have a question on the cognitive test that asks about the order of immobilization with joint injuries. If you can recall your NREMT Skill Sheet for the Joint Immobilization station, you’ll know that first you immobilize the site of the injury, then the bone above the injury, and finally, the bone below the injury. When you get questions on a practice written test that want you to put anything in chronological order, you should immediately run through your practical test in your mind. 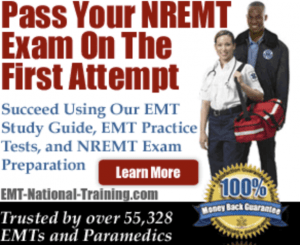 An ideal way to find the kind of practice test questions that best mimic the real exam is to use a reputable subscription review program like EMT National Training. They have over 3,000 practice questions in their data bank for emergency responders, EMTs, AEMTs, and paramedics. With their system, you can review material, custom build shorter or longer practice tests in the areas that challenge you most, and take full-length simulation exams. A new feature on the EMT National Training site also provides interactive skill stations for three parts of the psychomotor exam: Bag Valve Mask Ventilation, Medical Assessment/Management, and Cardiac Arrest Management/AED. When you go back and forth between the practical and written exam sections, you’ll be reinforcing the material all the better. If you get questions wrong, the site provides rationale for the correct answers and even offers telephone and email support for more in-depth questions. The great thing about the Skill Sheets is that access to them isn’t just limited to the test administrators. You can view, download, and print the skill sheets for each exam station from the National Registry website. Unlike with other exams you may have taken, the NREMT practical test is not intended to trip you up or make you fail. The goal of the exam is to make sure than anyone serving as an EMT or paramedic is ready for the job, so the National Registry does everything possible to bolster students’ success. Skill sheets are available online for every exam level: First Responder (EMR), EMT-Basic, and Advanced (AEMT, I99, and Paramedic). Once you’ve obtained the Skill Sheets for your level, you can use them to help prepare for the exam. While some people feel just covering all the bases on the sheets will allow you to pass, it’s a better rule of thumb to memorize the sheets in order, at least until your exam is over. Once you’re working in the field, you’ll still perform certain steps in the same order as you did on the test, but the patient status will obviously be different, and you’ll have to jump around a bit (like if a patient regains and loses consciousness multiple times). Meanwhile, it will be easier for you to remember all the steps, and it will likely make your examiner happier if you perform the skills in the order in which they’re listed on the sheets. The following are some top tips for creating the best strategy for a high NREMT practical exam score, using the Skill Sheets as part of your arsenal. 1.Use the Skill Sheets as an outline or a memory device for the practical stations—they are not a script in and of themselves. So, for example, when the sheet for Cardiac Arrest Management says “Checks patient responsiveness,” you wouldn’t simply say, “I’m checking patient responsiveness.” You would instead say something like, “Sir, can you hear me? Sir, open your eyes!” while applying appropriate sternal stimulation. Use an interactive practice module like the ones on EMT National Training. When studying alone, cover up the steps on the NREMT skill sheets, and force yourself to recite them without seeing the answers. Work with a study group, and have one person simulate the examiner. Take turns rotating through the roles of patient, test taker, and administrator. Create flash cards for each station, and have someone quiz you on the protocols. Write each step for every station on a sticky note, and randomly rearrange them. Then, place them on a board or tabletop in the correct order, working from memory and logic. 3. When you review something for the cognitive test, make a mental and/or physical note of how it applies to the psychomotor test and vice versa. Don’t think of the exams as two separate entities but as different ways of expressing the same information. 4. Always know the underlying anatomical and physiological reasons behind the protocols you are using. When you understand the “why” of an algorithm, it goes from being something you could memorize and quickly forget to something you’ll remember for your career. You’ll also be able to explain it to a newbie once you’re a senior EMT. For example, if you understand the concept of hypoperfusion (shock), it makes complete sense that you would need to position a patient properly, give oxygen, and minimize heat loss when treating a patient in shock from a bleeding emergency. 5. Remember that your mind is racing in any high-pressure situation, whether that’s your NREMT psychomotor exam or a real-life ambulance call. Time will probably seem to move very fast, and while you can’t dilly dally with providing care, it’s always fine to take a few seconds, breathe, and think about what the best response is. Don’t feel anxious about doing everything fast; some of the best EMTs in the field are those who are methodical and calm when they act. Know that your Skill Sheets are like the foundation for a house; everything you do in the field is built off these protocols. When you understand the rationale behind them and when you can adapt them to real-life situations, you will be grateful for that framework, as you will when you make them part of your written and practical test study process. Even physicians in the most difficult subspecialties use step-by-step branching algorithms for patient care, and it’s a model that works. Embrace it now, and you’ll perform better on your NREMT exams and better as an EMT in the field. Bookmark Paramedic Training Spot for more great information.